Threaded black-iron gas pipe distributing fuel through the house was up until recent time, the only type of material permitted (not the only one used) by code in Illinois, with copper, aluminum tubing / piping used as final connections to supply gas burning appliances (max 10′ long, entire section should be visible), and flexible connectors. 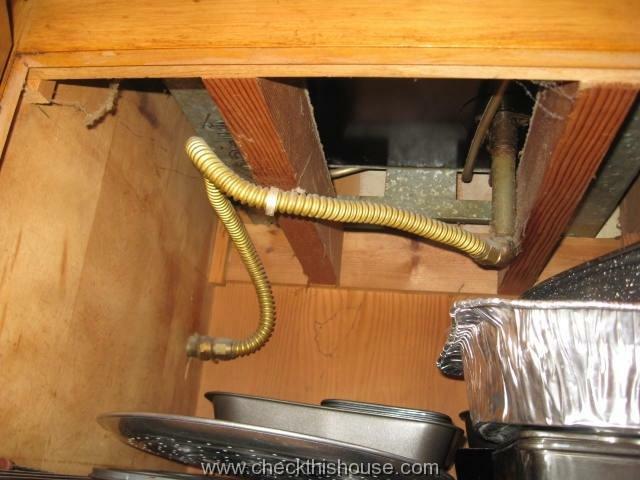 You might see variations of gas pipes listed above spliced together in your house, and if you think, that it doesn’t look right, call the plumber or utility company. So what is right?… I’ll start from flexible Gas Appliance Connectors: in Illinois, most common applications are stoves, ranges, cook tops, clothes dryers and portable room heaters. Unlike in other states, in Illinois, flexible gas connectors they can not be used for any stationary appliances, permanently secured in place, like furnaces, boilers, water heaters, which require rigid pipe for final connection. In the past, most of the flexible connectors were made out of uncoated brass (not manufactured for more that 2 decades), and some of them could be dangerous (it is very difficult to tell which ones are, by just looking at them). Therefore, DON’T EVER pull out your appliance to check the connector type, because it might separate, brake apart, and cause an explosion (I’ve seen many brand new appliances still connected with those old, uncoated brass connectors). Use a flashlight and a mirror if necessary to look under the appliance – make sure that you’re not dealing with the old type. – don’t use more than one connector per single appliance – don’t splice together two or more shorter connectors – they need to be readily accessible (visible), they shall not pass through floors, walls, ceilings and appliance enclosures – there might be some appliance manufacturer exceptions !. 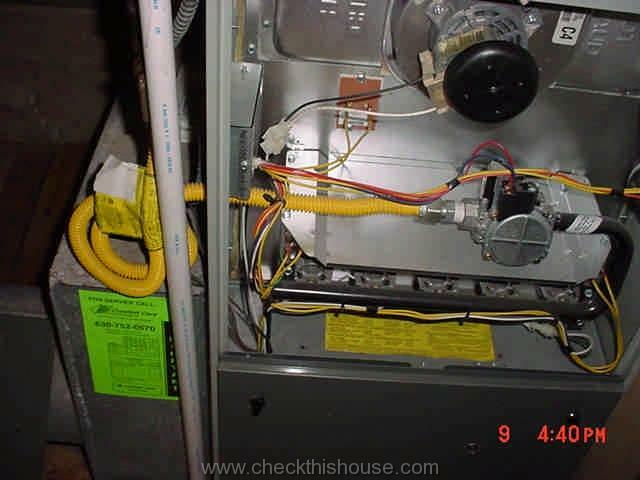 It is recommended, that any flexible connector should be replaced whenever the appliance is replaced or moved from its location (for more detailed information about gas regulations in Illinois, go to this website: Illinois Peoples Gas and North Shore Gas , navigate to “Construction Guide“, fill-up simple form and download this free booklet – very helpful information). Second, fairly easy to spot, and very common problem with gas pipes is type of Teflon tape used sometimes on pipe connections / threads. 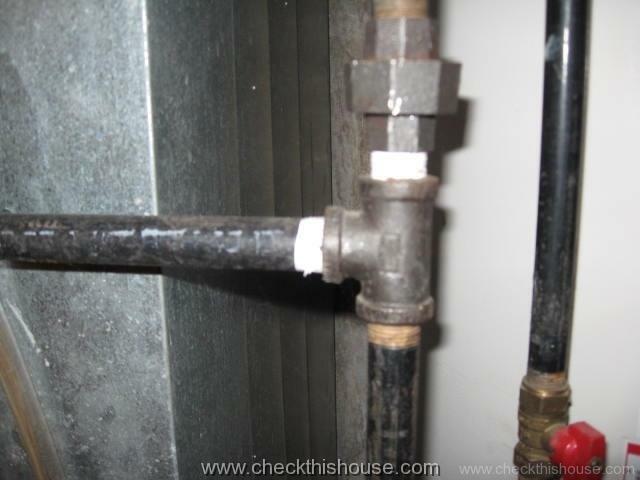 White Teflon tape use on gas pipes (when you look at areas where pipes sections are jointed together, or connect to any appliance, thin, white tape might be applied at those locations) is forbidden, because small pieces of tape can get shredded during assembly, break off, and flow downstream to block a gas valve. There are special compounds (pipe dope), and yellow Teflon tape dedicated for use on gas pipes connections. Gas leaks…, very common on older pipes, with hardened, deteriorated pipe dope, and on some gas shutoff valves. While living in the house, we get used to its smell, and might not be able to detect small gas leaks (natural gas is odorless, and distinctive smell you might recognize is added by the gas company to help you detect gas leaking into the air… smells kind of like rotten eggs, and is called marcaptan). 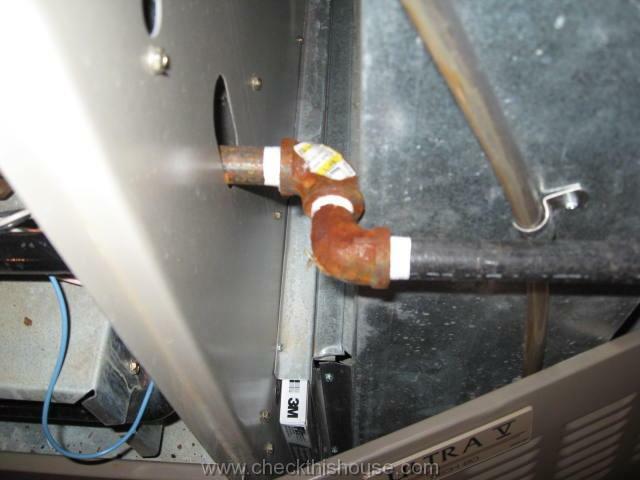 Sometimes, you go away for a weekend or vacations, and when you come back, that “gas smell” is there – open doors and windows, call your gas company, it doesn’t hurt to have it checked. As I mentioned at the beginning of this post, threaded black-iron pipe used to be the only pipe permitted for gas distribution in Illinois houses. However, during last few years, another product, since 1989 widely used through the US, finally became available and approved for installations in IL. ” CSST is not designed to be used as a flexible gas appliance connector and shall not be used as a substitute. The use of CSST as a final connection for permanently installed appliances, such as water heaters, furnaces and boilers is allowed. CSST shall terminate outside of the appliance jacket where the excessive heat may ignite or damage the protective coating. A lack of familiarity by code officials may present problems. Performing CSST installations requires The Contractor to obtain special training and certification (not just any licensed plumbing contractor can do it).